What exactly do you eat on a whole foods, plant-based diet (WFPBD) (or should I say, living a WFPB lifestyle?). Getting the diet is right is essential for getting the results you want. As Dr. Pam Popper says, seeing results from the diet is like opening a combination lock. You can't open it with only two of the three numbers. And you won't get the best results from following the diet 75% of the time. Especially if you are sick with heart disease or diabetes. Adherence is the key to success for arrest and reversal therapy, as Dr. Caldwell Esselstyn commonly advocates. This is not meant to deter anyone from slowly transitioning into a WFPBD, but to be honest and give you a heads up. If you only do the diet 50% of the time and you don't experience any results after three weeks, you can't say the diet didn't work. Plus, when you completely go for it, you're cholesterol levels can drop within one week for example. Experiencing fast results while never having to restrict calories, are HUGE motivating factors to sticking with the diet. What are whole, plant foods? A whole foods, plant-based diet is made up of well, whole, plant foods. Whole plant foods are those that can be picked and eaten directly from the garden. 'Whole' plants are eaten in their original form and contain all of their original nutrients. What does a WFPBD include? Yup, it's that simple. 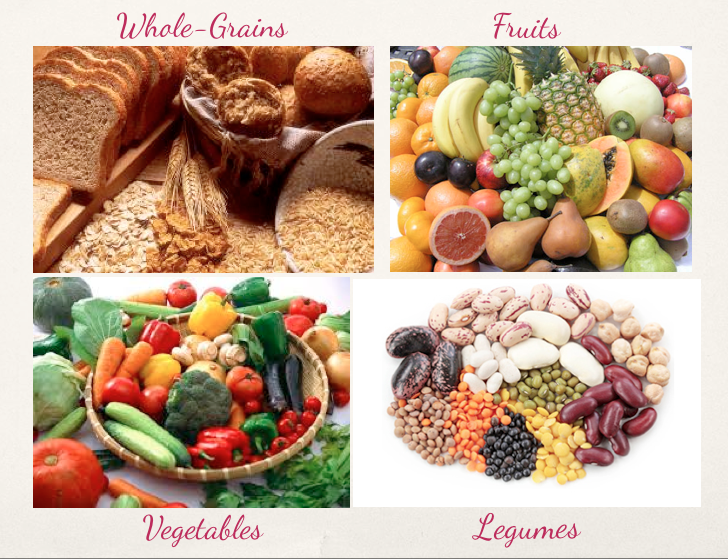 Whole-grains, fruits, vegetables and legumes (beans, peas and lentils). And there is such a variety within each food group. Your palate will no-doubtedly expand diving into this culinary world. Two - three ounces of organic animal meat (not dairy) is permitted per week. That's the size of your palm. Not only do we have to ensure we are eating a diversity of the four food groups each day, it's crucial we get certain food groups out of the diet as well. What not to eat. Food to avoid. Yup, that's right. No animal products of any kind. No dairy, no meat (including fish) and no refined foods. Here is the exception: if you are healthy, have no major diseases, you can eat 2-3 OUNCES (the size of the palm of my hand) of ORGANIC meat (not dairy) once per week AS LONG AS the you are eating whole, plant-based foods the rest of the week. Don't bend this rule! But don't worry, eating without the above foods is AWESOME. And your body will thank you for it... and quickly, again, when you do it right. Getting the refined foods out of the diet is essential for success. 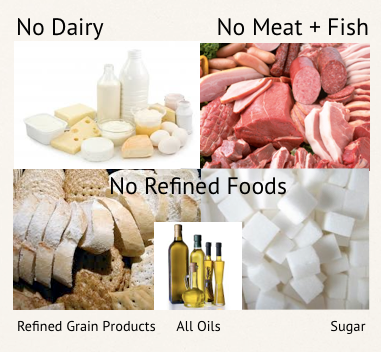 Refined foods are not whole foods. They don't contain all of their original nutrients. They've been stripped of their original nutrients and are empty calories. Refined foods contribute to weight gain, diabetes and a slew of health problems. Refined grain products don't contain all of their original nutrients. The fiber and many vitamins have been removed in this process. Most breads, crackers and flour used in U.S. food products are refined. Avoid them. Oils are also refined foods. When we eat olive oil for example, we aren't eating the 'whole' olive. We aren't eating the fiber and accompanying vitamins, minerals and antioxidants. We're just adding nothing but liquid fat and extra calories (that Americans don't need). Eat the 'whole' food instead--the corn vs. the corn oil. Use water or veggie broth to sauté instead of oil. Sugar is also void of any vitamins and minerals. It's empty calories, containing nothing but carbohydrate (which isn't any worse than oil. Carbohydrates at least give our bodies fuel--they're our preferred energy sources). So, that's a WFPBD on the most basic level. Avoid all animal and all refined foods products. Eat unlimited amounts of whole-grains, fruits, vegetables and legumes. Feel full and satisfied at every meal. This is hands down my favorite part of eating a WFPBD. I LOVE to eat. I come from a long line of big eaters (and big bellies) but when you eat whole, plant-based foods (especially starchy ones) you feel full and satisfied so you stop eating for hours afterwards. The fiber, water and bulk found in whole, plant foods all contribute to that feeling of satisfaction. But your greatest ally is starch. Whole foods high in starch are essential when eating a WFPBD. For one, WHOLE starchy foods such as 100% whole-grain pasta, winter squash, potatoes, corn, rice and beans are incredibly filling (and highly nutritious). Secondly, whole, starchy foods are much lower in calories compared to animal foods. So, you get to eat up, but eat less calories! Make whole starchy foods the staples in all of your meals. Top your starchy whole foods with a variety of fruits and vegetables to get the additional benefits of these nutrient powerhouses. If you stick to these guidelines, eating a WFPBD 90-95% of the time you can expect amazing results. What the hell am I going to eat? Making meals out of the four food groups is easier and more delicious than you'd assume. Most of your typical meals can be substituted with whole plant-foods. For breakfast you could have oatmeal or 100% whole-grain cereal with fresh fruit, or scrambled tofu instead of eggs. Whole-grain pancakes can easily be made with a nut milk and without oil. Lunch is as simple as baked sweet potatoes with salsa and salad or corn on the cob (use a lime wedge and chipotle powder instead of butter) with black bean soup. Dinner is pasta, pizza or burgers. Wait what!? Sure. Veggies instead of meat on our pasta, skip the cheese on the pizza and instead, over load it with veggies (even corn, beans and salsa are awesome on pizza). Our burger is a veggie burger with no-oil sweet potato fries. For a Free Resource Guide that has a list of my favorite recipe websites, make sure you're signed up to website and it will be sent right to your inbox (sign-up at the box at the bottom of this page). Commit to eating one whole food, plant-based meal by next Tuesday. Will you prepare something or buy it? Turn an old favorite into a new plant-based dish or try a new recipe. What will you do? Comment with your thoughts below.